Pressure measurements on Oct. 19 placed Hurricane Wilma as the most intense hurricane ever recorded over the Atlantic Ocean basin. Wilma dropped from a Category-5 to a Category-4 storm before its devastating landfall on Oct. 21 on the Yucatán Peninsula. Florida residents hoped that it would continue to diminish before heading northeast towards Florida, but the situation took a turn for the worse when Wilma regained intensity over Gulf waters. The NASA Aqua satellite captured this image of Hurricane Wilma on Oct. 20 as it approached Mexico's Yucatán Peninsula as a Category-4 storm. Wilma tops the National Oceanic and Atmospheric Administration's list of the most intense North Atlantic hurricanes (based on minimum pressure recorded) since measurements started in 1900. Hurricane Wilma (the first "W" since naming storms began in 1950) was not the only hurricane to follow this re-intensification pattern; hurricanes Katrina and Rita also grew in strength over the Gulf of Mexico. The onslaught of hurricanes this season has provided researchers with ample data to study conditions in the Gulf that contribute to hurricane strength. 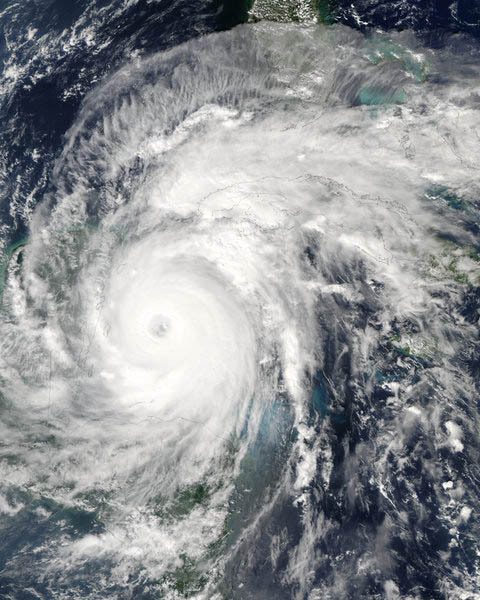 After passing the Yucatán and killing about 10 people, Hurricane Wilma weakened and then strengthened again into a Category-3 storm in time for its Oct. 24 landfall north of Everglades City, Fla., and resulted in the deaths of about 10 more people. Sustained winds were recorded at 200 kilometers per hour, which led to the loss of power for one-third of Florida residents, according to the Associated Press story. Damages in the United States could range anywhere from $2 billion to $9 billion. The damaging strength of Wilma increased when it "ran over a thing called the Loop Current," says Frank Lepore, spokesperson for the National Oceanic and Atmospheric Administration (NOAA) National Hurricane Center. The Gulf Loop Current connects theYucatán Current flowing into the Gulf of Mexico with the Florida Current that flows out. Acting as the dominant clockwise circulation pattern in the eastern Gulf of Mexico, the Loop Current spawns eddies that transfer warm water around the Gulf, which researchers say helps hurricanes to strengthen. The Gulf of Mexico is "like a big bathtub; it doesn't take much to heat it up," Lepore says. Warm eddies are more likely to destabilize and detach from the Loop Current during hurricane season, said Nick Shay, a meteorologist and physical oceanographer at the University of Miami in an Oct. 3 National Science Foundation (NSF) press release. The difference this year, according to Shay, is the extent of the Loop Current deep into the Gulf of Mexico. "A positive outcome of a hurricane season like this is that we've been able to learn more about the Loop Current and its associated warm-water eddies, which are basically hurricane intensity engines," Shay said. One week prior to Hurricane Rita, meteorologists from NOAA and the University of Miami dropped instruments from an aircraft into the Gulf of Mexico that profiled temperature and depths of currents. And two days before Rita, researchers from NOAA and the Scripps Institution of Oceanography released "drifters" that traveled with the Loop Current to measure temperature conditions in the eddies. Researchers at the University of Colorado in Boulder have compiled measurements of sea-surface height, gathered by satellites, to map the Loop Current, according to a University of Colorado Sept. 21 press release. They say that an elevated height of the sea surfaces correlates to deeper warm water, which increases the energy and intensity of hurricanes. "We have long been aware that these currents are an important way for the ocean to distribute heat and energy, but until now, we just didn't have much data on the role they played in building hurricane intensity," Shay said in the Oct. 3 press release. NSF's Division of Atmospheric Sciences funded the NOAA and University of Miami research to help meteorologists predict the paths and intensity changes of future hurricanes over the Gulf.